Endless Slideshow Screensaver is software for Windows allowing you to view your photos in a beautiful slideshow with more than 200 vivid transition effects! Follow these simple step-by-step instructions to get started in just a few minutes. First of all - download and install the most recent version of the screensaver using the button below. Once the installation is complete you will see standard Windows Screen Saver Settings dialog with Endless Slideshow Screensaver preselected. 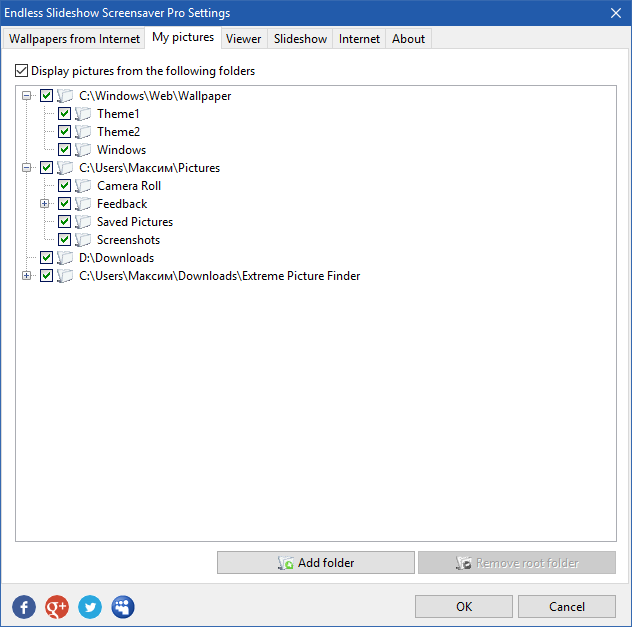 Now click the [ Settings... ] button to open Endless Slideshow Screensaver settings window. 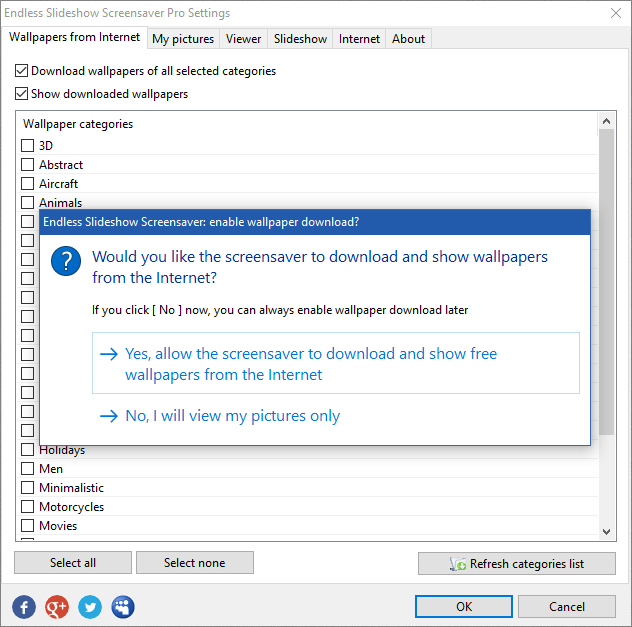 When you do it for the first time - my photos slideshow screensaver will ask you if you want it to download and show fresh wallpapers from the Internet or view only your photos. So, if you don't want any wallpapers, just your photos - click [ No ]. Now select My pictures tab, check the [ Display pictures from the following folders ] box, click [ Add folder ] button and select the folder with your photos for the slideshow. You can add as many folders here as you wish. This is it. Slideshow of your photos is ready. You can also check other options to personalize your slideshow the way you want by adding different overlay text, choosing background image and adding frame around the photos. The screensaver can start automatically after the selected period of inactivity. You can configure this timeout in the Windows Screen Saver Settings window shown above. You can also start it manually using a shortcut created during the installation on your desktop and in the Endless Slideshow Screensaver folder of Windows Start menu. Just click Start Endless Slideshow Screensaver and enjoy beautiful photo slideshow!